Jacksonville Armada FC heads into the 2017 NASL Fall Season with a new leader. Florida-based entrepreneur Robert Palmer was announced as the club’s new owner on June 18. Palmer owns several businesses, including RP Funding, which is the club’s new jersey sponsor. He also has deep ties to the Jacksonville area. 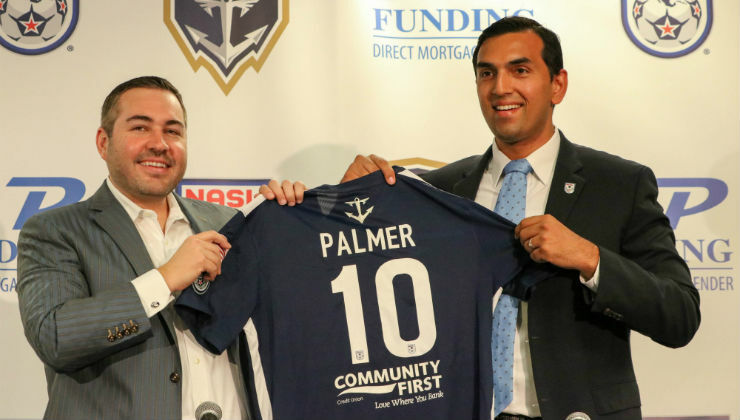 Now, Palmer is hoping to deepen those community ties for Armada FC. During his introductory press conference, Palmer noted his desire to build the club a training facility and eventually a new stadium for Jacksonville’s NASL matches. While those goals are more for the long term, Palmer’s first order of business was locking up coach Mark Lowry and technical director Nathan Walter through the 2021 season. Jacksonville may also look to add to the squad to bolster its efforts towards reaching The Championship, the NASL’s four-team postseason tournament. “There’s a couple of player gaps that Nathan and Mark want to fill that I will be supportive of,” Palmer said. To accomplish his short and long-term goals, Palmer views the NASL and the Jacksonville community as the perfect launching pad.